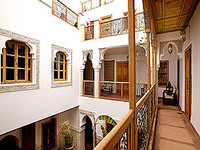 Magnificent riad located in the medina of Marrakech. Nestled in a 10 acre olive grove , and housed in a fully-restored farm house , Villa Abalya offers secured exclusive accommodation near Marrakesh , Morocco. Several golf courses are located nearby. This luxury villa in Morocco boasts a wonderful verdant location as well as state-of-the-art services , providing guests with a private garden and swimming pool , massages , and 3 panoramic roof top terraces. A courtesy car is also provided , free of charge. Djemaa El-Fna is the highlight of any Marrakech night. Musicians, dancers, and story tellers pack this square at the heart of the medina, filling it with a cacophony of drum beats and excited shouts. The souks (suuqs), or markets of Marrakech, just adjacent to Place Djemaa El-Fna, are where you can buy almost anything. From spices to shoes, jellabas to kaftans, tea pots to tagines and much, much more. Koutoubia mosque, right besides Djemaa El-Fna, is named after the booksellers market that used to be located here. It is said that the minaret of the Koutoubia mosque is to Marrakech as the Eiffel Tower is to Paris. Saadian Tombs were not discovered until the beginning of the 20th century. They have been preserved just like they were during the glory days of the Saadian rulers. Unlike the El Badi Palace, they were not destroyed, probably for superstitious reasons. Majorelle Gardens provides an excellent respite from the hustle and bustle of the city streets. The park boasts a collection of plants from across the globe, including what seems like every cactus species on the planet. Ben Youssef Madrassa is one of the largest Madrassa's in the North Africa. It is a school attached to the Ben Youssef Mosque and is home to beautiful art and architecture. El Bahia palace is an ornate and beautiful palace, popular with guided tours and stray cats. El Badi palace is a palace now in ruins and inhabited by storks and stray cats. Copywrite - www.worldaccomodation.com - our website offers Marrakech accommodation, rooms in hotels in Marrakech. 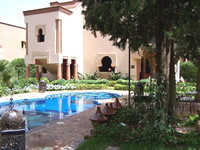 We advertise accommodation in Marrakech by owners or hotels in Marrakech through hotel affiliate sites.